The MegaRAID® SATA 300-8ELP offers SATA II 3 Gb/s performance with the advantages of LSI MegaRAID SAS (Serial Attached SCSI) core technology. 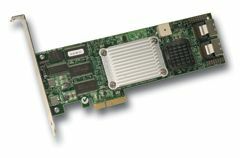 The controller features a high-bandwidth PCI Express host interface, support for SAS expanders for up to 16 devices, and an intuitive new RAID management utility. Offering data transfer rates of up to 3 Gb/s per port in a low-profile form factor, the eight-port MegaRAID SATA 300-8ELP addresses the growing demand for RAID in high-density rack-mount chassis environments. Based on our proven MegaRAID technology, complete with a high-performance Intel I/O processor and 128MB embedded DDR SDRAM, the MegaRAID SATA 300-8ELP provides the highest performance SATA RAID solution for data-intensive storage applications.